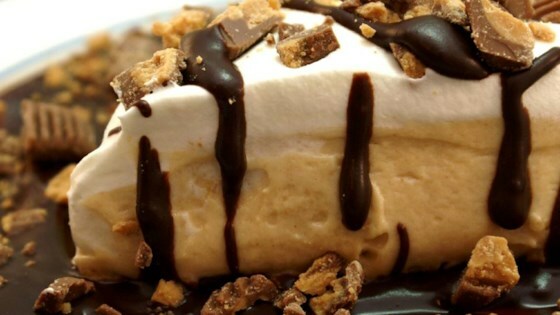 "Peanut butter refrigerator pie, very easy to make. Originally submitted to ThanksgivingRecipe.com." I used a store bought Oreo crust and added coarsely chopped Reese's PB cups on top. Quite a rich dessert...my husband loved it! To make this even more decadent, freeze the pie after you spoon the filling in the crust. After it is frozen solid, add a layer of hot fudge sauce before adding the whipped topping. This is a great and easy recipe. Sets up much better than other peanut butter pie recipes I've tried which turn out way too soupy. Really good and can be made lower in fat and calories by subbing in lite cream cheese and whipped topping.